There’s a nagging voice inside my head telling me that I should review/judge this film on its merits and not make comparisons. But that’s not gonna happen. Sirk’s 1959 remake (or more accurately, re-adaptation of the Fannie Hurst novel) is one of my favorite movies. Of course I’m going to look at this earlier version through that prism. So let’s just accept that and move on. This review will probably not be very helpful if you haven’t seen the 1959 film, but oh well. John M. Stahl’s version measures up well in some areas, not so well in others. Sirk’s flair for melodrama is more affecting. While I still shed a few tears for this one, it wasn’t as much of an emotional punch in the gut. This may be largely due to the structuring. Stahl’s version feels oddly paced, and hits you with a bunch of stuff at once. The love interest (Warren William as Steve Archer, the only character with the same name in both versions) doesn’t show up until nearly halfway through the movie, and that relationship is less complex. Also, Stahl wraps up the wrong storyline first, giving us a coda that should have come before the big emotional scene. This one ends on the line “I want my quack quack”…. no, really, it does. The movie just doesn’t flow as well as Sirk’s does. As far as casting, I’d call it a wash. I like Claudette Colbert (Bea) more than Lana Turner (Lora) in general, but I’d call their performances roughly equal. Perhaps the greatest asset of Sirk’s film is Juanita Moore (Annie) and it would take a lot to top her, but Louise Beavers (Delilah) does a pretty good job considering the role. We can ignore the children, but I will say that Sirk’s young Susie (Terry Burnham) and Stahl’s young Jessie (Juanita Quigley) are both pretty damn annoying. For the adolescent actresses, I might have to give the edge to Stahl. Rochelle Hudson (Jessie) is less grating than Sandra Dee (Susie). And as much as I love Susan Kohner (Sarah Jane), Fredi Washington (Peola) gives her a run for her money. They’re both great, I just wish Washington had as many scenes as Kohner did (it may be worth noting that Washington was actually a light-skinned black woman like the character, while Kohner was half-Latina). As for the Steve Archers, William is fine but I like John Gavin a little more. Each version also has a kind of mentor/manager character… Ned Sparks (Elmer) in Stahl’s, Robert Alda (Allen) in Sirk’s. Sparks stands out more, for better and for worse. He’s got some funny bits but he can also be a little irritating. Understandably, the 1934 version is more uncomfortable in its racial depictions. If you thought Annie was too obsequious, you ain’t seen nothing yet. You can’t help cringing at Delilah’s eagerness to rub Bea’s feet, or her getting horrified at the thought of having her own house and not being able to look after white people any more. You don’t get as much of a sense of her dignity and intelligence as you do from Annie. Still… this may be the more progressive film. 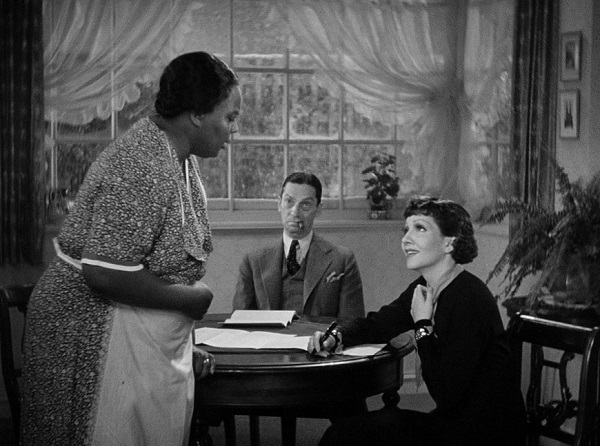 1934 was before there was a civil rights movement, and few films of that time cared about black characters, much less tried to deal with complex racial issues. It’s also more progressive from a feminist angle. Lora is an actress… Bea starts a business (one of the film’s finest sequences) and grows it into a pancake empire. This entry was posted on April 11, 2015 at 7:18 pm	and is filed under Movie Reviews. You can follow any responses to this entry through the RSS 2.0 feed. You can leave a response, or trackback from your own site.